After being unveiled at this years PlayStation Experience 2016 more details have now been released by James Austin Director at developers Wonderstruck about the new upcoming PlayStation 4 and PC game Boundless which is currently in its pre-Alpha stage of development. Boundless takes the form of a sandbox experience that allows all players to inhabit a single online universe. Watch the reveal trailer below which was shown earlier this year at the PlayStation Experience 2016 to see what you can expect when the game launches on PS4. 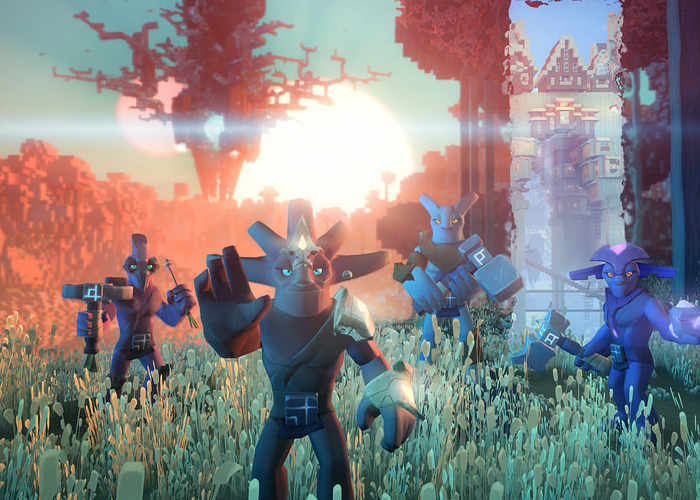 Whether you are a seasoned hunter, a weathered explorer, a master builder, a shrewd trader or a natural born fighter, there is a place for you in the massive open-world sandbox universe of Boundless. Watch the sunrise on one world before hunting down epic Titans on another. Explore caverns on your own or build a city with your guild. Mine, trade or fight Protectors for resources and search for elusive Oort technology. The Boundless universe is created by a huge graph of connected worlds. Where each world is a fully traversable voxel planet. Boundless is a physical sandbox where you can grapple, swing, slide, bounce, stumble, and fall through a unique and diverse landscape. Every world in the universe is visible in the sky of every other world, either as a point planet for distant worlds or a stunning real time planet rendered in the sky. You can look up in the sky from your home planet, see another world, see another civilisation living on that world and see everything that its inhabitants have constructed. Using your sacred Totem you can mark a location at any point on the remote world, construct a portal, activate the marker, and open a live doorway into that world. If the terrain looks stable, the atmosphere seems breathable, and the creatures are at a distance – then it’s safe to instantly step from one world into the other. Boundless is an online universe built and ruled entirely by its players. Claim a plot of land to build and protect your first home. Then gather together in a guild to claim enough land to construct a city. If your city is the most prestigious on the planet then you claim the title of its capital and rule the world. But why stop there? The most powerful guilds will race to claim the universe.